Peter Biggs of The Light Magazine has written 16 ‘snapshots’ of Metro Vancouver / Fraser Valley municipalities over the past two years. This final one features Langley, Fort Langley and Aldergrove. 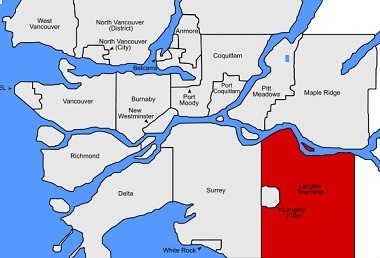 The Township of Langley is bordered by Surrey at 196th Street and Abbotsford at 276th Street, with the Fraser River to the north and the U.S. border to the south. Population 117,285. The City of Langley remains a separate authority with its own mayor and council. Population 25,888. Langley is made up of different communities and does not have an iconic centre. Several communities retain their own identity: Willoughby, Murrayville, Brookswood and, north of Highway 1, Walnut Grove and the picturesque village of Fort Langley. In the southeastern corner of the Township of Langley is Aldergrove. Langley was the first part of the Lower Mainland of BC where European settlement was established. Fort Langley was built in 1827. In 1858, following the discovery of gold along the Thompson and Fraser Rivers, Fort Langley became a large supply centre, outfitting thousands of gold miners passing through the area. The Gold Rush also caused a significant increase in farming operations, as the demand for food rose. Growth of population and development has continued from the 1960s until now – with noticeable new housing developments off 200th Street, in the Willowbrook and north Langley areas. For the past 25 years, Langley City and surrounding areas have seen extensive strip mall development. Efforts have been made to retain a small town core, Like many other places, larger businesses and banks have moved to the malls, fostering an automobile dominated community. Surrey and Langley are among the fastest-growing communities in the Lower Mainland. Over the next 30 years, the City of Surrey, City of Langley and Township of Langley are expected to welcome more than 400,000 new residents. The newly elected Langley City Council ran on its clear preference for a seamless extension of SkyTrain’s Expo Line from King George Station in Surrey to Langley Centre. While work will begin immediately on planning for a SkyTrain line to Langley, TransLink is cautioning that it will likely take time for the 17 kilometre line to be fully completed. Aldergrove, located at the junction of Highway 13 and the Fraser Highway, is a community within the Township of Langley. It is an urban centre, and though not incorporated as a town it is often referred to as one. Population 15,500. Surrounded by Agricultural Land Reserve, Aldergrove is notable for hosting Canopy Growth Corporation, the largest federally licensed cannabis facility in the world. Also located in Aldergrove are the Greater Vancouver Zoo and the Twilight Drive-in movie theatre, the last drive-in still to be found in the Lower Mainland. Fort Langley is a village community within the Township of Langley situated on the Fraser River. Population 3,400. It was intentionally constructed in the 1820s on the south bank of the Fraser River; in the event that Fort Vancouver (on the site of what is now Vancouver Washington, on the border with Oregon) was lost to the Americans, then Fort Langley would secure British claims to both sides of the Fraser. The home of the Fort Langley National Historic Site, it was a former fur trade post of the Hudson’s Bay Company. In recent years, many of the village’s old buildings have been restored. Many new buildings have been constructed following strict style guidelines to match the town’s heritage appearance. The unique heritage-style stores, combined with a rural river-side setting make Fort Langley a thriving tourist centre. 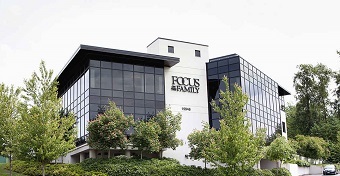 Focus on the Family Canada is based in Langley. Light Christian Media (publishers of Light Magazine and Alberta’s City Light News) also has it s office in Langley. 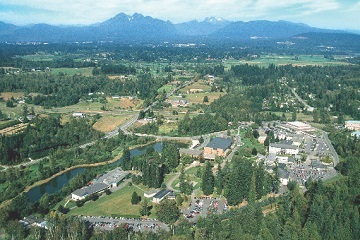 An aerial view of Trinity Western University. With more than 4,000 students and 600 employees, Trinity Western University’s presence is felt by the whole community. Fully accredited by the Association of Universities and Colleges of Canada, its academic reputation is high. Situated out of town towards Fort Langley, most students live locally – with about 25 percent living on campus. Trinity Western grants bachelor’s degrees in 45 academic majors, and 56 minors and offer over 1,200 courses. Graduate students take courses through the Faculty of Graduate Studies and ACTS Seminaries. Master’s degree programs are available in the humanities, education, linguistics, psychology, business, nursing and theology. Founded in 1985 and situated on the Trinity Western campus, ACTS Seminaries is a unique partnership. Four seminaries (Canadian Baptist Seminary, MB Biblical Seminary, Northwest Baptist Seminary, Trinity Western Seminary) work together to form and equip men and women to serve God in the church and the world. Our program exists to provide rehabilitative care to people in addictions. It is a faith-based, non-smoking community living experience on a working farm. We use classroom learning and one-on-one mentoring to teach tools for healthy relationships which residents can then practice applying in daily life at the farm. The growth that our residents gain in these skills while in the Wagner Hills community prepares them for a successful life beyond the program. The program length is a one year commitment, with intake happening on a continual basis. Langley is home to about 65 churches, including . 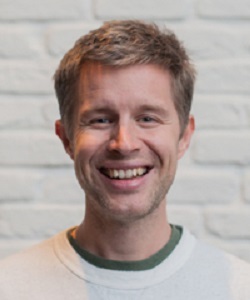 . .
Marty Mittelstaedt is an associate pastor at Christian Life Assembly. This large and prominent church can be seen from various Langley locations. Christian Life Assembly (CLA) has around 1,300 or so in regular morning attendance. Sunday evenings see an additional 300 at Recovery Church. Around 70 percent of our people come from the Langley / Surrey area; we are multi-generational with around 350 kids and 250 youth. The church has always had a heavy missions focus – last year around $1 million went to support 40 missionaries. We moved from an attraction model to now emphasizing empowering our people to reach out into their neighbourhoods. It’s now ‘Gather, Grow, Serve, GO!’ We do run the Alpha Course three times every year. Last year CLA baptized 70 people. 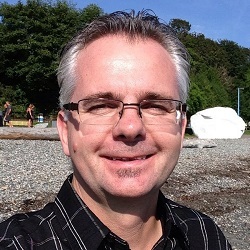 Cliff Ursel is site pastor for Village Church in South Langley. “We use video sermons from Surrey’s services, and our own worship band to serve the 1,300-1,400 people who come,” he said. The Village Langley North site (held at the Colossus Cinema just north of Highway 1 on 200th) uses both video of the sermon and video of the worship. The church also runs Freedom Session weekly for around 85. 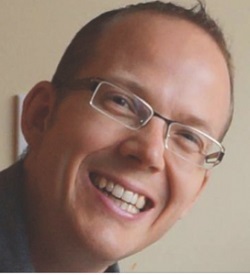 Luke Knight is an associate pastor at Living Waters Church in Fort Langley. Living Waters Church is surprisingly large in number after almost closing in the 1990s; they now see 800 – 900 weekly at three services (the building only seats 300). The church does the Alpha Course two or three times a year and is very involved in community events such as the Cranberry Festival. “We’ve done prayer walks in the new Bedford Community,” Knight added. 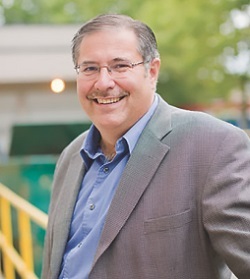 The Langley Christian Leaders Network (LCLN) represents the majority of churches in both the township and city, led by an executive headed by Dave McTaggart. The long-time lead pastor at Southgate Church is passionate about the unity of churches in Langley. Along with his wife Tomana they founded Southgate 22 years ago; the church now welcomes over 500 each week. Leaders from St. Andrew’s United, Fort Langley Evangelical Free and St. George’s Anglican meet every month to share and pray. They work together on things such as Good Friday’s Stations of Holy Week. The LCLN facilitates Good Friday services usually at CLA; 20 – 25 churches are involved, with local pastors taking various parts of the service. Demographically we’ve seen some migration from Vancouver and there are a lot more ‘people groups’ ethnically. Some churches have adapted dynamically. Mountain View Alliance has four different ethnic congregations using their building. Langley is a community of communities, each having a sense of their own civic pride. One church was struggling – their pastor had left (not well). Three or four of us pastors preached for them and were invited to meet with their eldership to give them counsel! 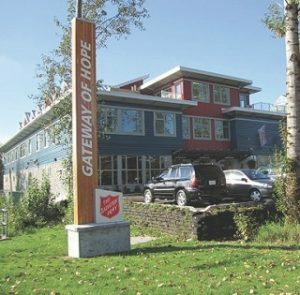 Langley is home to the Salvation Army’s Gateway of Hope. Addressing ever-increasing social needs, they offer an impressive range of services, including a 32 bed emergency shelter along with an additional 30 mat relief shelter. In cold weather they add an 15 additional mats. “We are often at capacity!” said Christina Schneiter, residential services manager. Gateway also houses people in their Transitional Housing Program (over 9,000 bed nights in 2017). “Day by day we feed 300 – 400 people with a nutritious meal,” she added. Family Services, nursing visits, counselling, spiritual care, showers, laundry and many other services are also available. 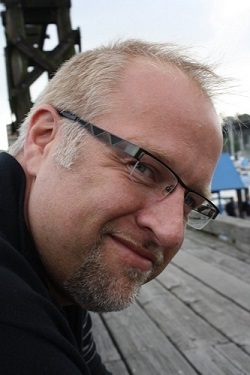 Go here for The Light’s Langley profile and here for all 16 municipal profiles.